Each year hunters wait patiently for “the rut”, when bucks undoubtedly are less cautious and more visible in their vagrant search for does. Breeding time can in fact be a very productive time of the year to bag a trophy buck, as they are the most active during this part of the season. Don’t be fooled though, just because bucks are out and about doesn’t mean you can just climb into a stand and shoot. We have compiled a list of tips and techniques that, when implemented correctly, can drastically increase your odds of getting a monster buck. Know the area you are hunting – Scouting is very important during the rut. Generally the rut will occur at the same time from year to year in a particular area. Be aware of the phases and when they occur in your neck of the woods so you can properly forecast deer movements. Most importantly, if you know an area is a goldmine from year to year, do not hunt it too early and give yourself away! Pre-Rut – The most concentrated phase of breeding in which bucks will travel their territory throughout the day checking does for breeding readiness. Most often during this period bucks are so focused on breeding they are less likely to pay close attention to their surroundings, giving hunters the best chance of catching them off guard. Post-Rut – The most challenging of all the phases. Bucks are still searching for unbred does, but they are less active and more cautious. Understand your land – Be aware of the topography of your hunting land as well as where the does tend to congregate, typically near food sources. Understanding the layout of your land and travel patterns will allow you to pinpoint a prime spot in which to watch for deer. Funnels, Logging Roads, L’s, and Field Corners are all great places to place your stands as most traffic will cross these paths. Most often bucks will cruise for does downwind at a quarter angle as this is the best direction for them to catch a scent. Therefore, it is important to be aware of wind direction and how it affects your stand locations. Attracting the big one – Decoys, attractants, and grunts can be tricky; overuse can give away your position in an instant. On the other hand, when used correctly, they can get the attention of a monster whitetail that may not otherwise have crossed your path. Scents – Scents such as doe estrus can be used on and around scrapes and rubs to create the sense that a doe is nearby and ready to breed. In some instances, dominant buck scents can be used in the same area to cause a mature buck to feel challenged. The best piece of advice for a hunter, though, is to be completely scentless. Scents on the ground can be key, but scents on a hunter can be a dead giveaway. Rattling – Deer season is not turkey season; there is no need to continuously call. Constantly calling and making noise can significantly decrease your chances of crossing paths with the buck you want. Another common mistake hunters make is expecting calls to attract only mature bucks looking for a fight, this is not necessarily true. Typically inferior bucks will be more attracted to these sounds than mature deer. Rattling and grunting should be used carefully and sporadically to entice a visible buck that may not be headed in your direction. Bucks, out of curiosity, will gravitate towards the sound of sparring. 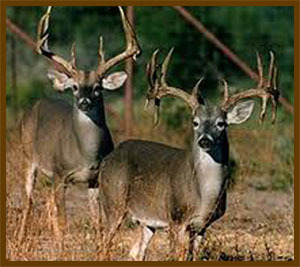 Decoys – Doe decoys can be used to attract a buck into checking for pheromones, so they should be paired with estrus scent. Decoy bucks can also be a way of attracting a male that is claiming his territory, although it is not recommended to use buck decoys during post-rut. Bucks during this phase are more focused on breeding the last of the does and tend to avoid confrontation. The downside to using a decoy is that if the buck you are trying to attract realizes the decoy will not move, it may run and spook surrounding deer. Patience is a virtue – The best piece of advice while hunting the rut is to be patient. Although the deer are moving, their patterns during this time of the year are very difficult to track. If you do not see a buck from the stand you’re in, don’t just jump ship to another territory. Commit to an area of about 150 acres and scout, moving location within that area until you sot the buck you want. Get out of bed early. It’s best to be in a stand at least an hour before sunrise and prepare to spend a long day in the stand. Mature bucks tend to move more in the afternoons during this time of the year, but you don’t want to get there late and miss a biggie. Hopefully these tips and techniques will have you bagging a trophy buck this rut season! Don’t forget to always practice safe hunting!